dental orthodontics Atlantic City: Do I Need an Emergency Dentist? Do I Need an Emergency Dentist? No one thinks that they will have a dental emergency in their lifetime. Unfortunately, around 5 million teeth are knocked out every year, which means that many people end up with surprise trips to the dentist. Fortunately, with emergency dental services, it’s possible to avoid permanent damage to teeth. The key is to be prompt about addressing the concern. 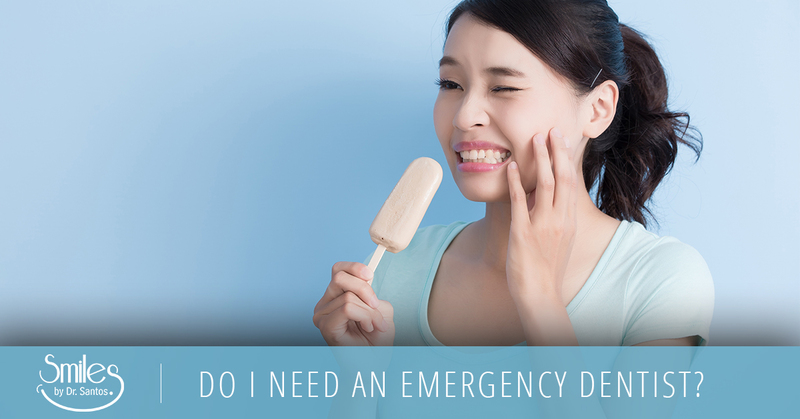 Aren’t sure if you are having a dental emergency or not? Read this blog to determine whether or not you need to come see Dr. Santos as soon as possible. First, here are some situations that don’t necessarily warrant an emergency trip to the dentist. If any of these are your issue, you can wait a day or two until you can visit Dr. Santos during regular office hours. Regardless of what caused your injury, if your teeth are broken in large pieces or your tooth has been completely removed from its socket, it’s time to come into our dental clinic as soon as you can get in the car. If you don’t immediately seek dental attention, the nerve of your tooth could die before the tooth can be sealed or put back in place. If your mouth is throbbing with pain, this is a clear indication that it is time for emergency dental attention. Pain tells you that something is wrong, especially if that pain doesn’t go away within half an hour. You can start by icing the area, taking an ibuprofen, and rinsing with saltwater. If none of these efforts help, it’s time to head into the dentist to find out what’s going on. Has a large abscess appeared in your mouth? Does pus seem to be coming out of it? This indicates an infection that needs to be addressed as soon as possible. Come into your dentist in Atlantic City and we will set you up with antibiotics and a diagnosis. If you are one of the many people with gingivitis, you may be used to your gums occasionally bleeding when you brush them. Similarly, you may have bit your lip and caused it to bleed, experiencing slight discomfort for a few minutes. However, if you begin bleeding for any reason and it won’t stop, this indicates that you need immediate medical attention. If the blood appears to be rapidly flowing, go to the emergency room. Are your gums swollen? Is your jaw too stiff to open and shut? Swelling is an indication of an infection, and if it doesn’t go down promptly, it warrants an emergency dentist visit. When you come to Smiles by Dr. Santos, we can give you the antibiotics you need to stop the infection from spreading. At Smiles by Dr. Santos, we are happy to provide emergency dental services when you need them. Contact us ASAP and we will be sure to take care of any dental emergency promptly and professionally.